Masonic Armchair, 1780-1800. England or France. Collection of the Grand Lodge of Masons in MA, GL2004.0793. Photograph by David Bohl. Tracing Board, 1863. MA. Scottish Rite Masonic Museum & Library Gift of Trinity Lodge, A.F. & A.M., Clinton, MA, 97.007.1. Photograph by David Bohl. Bowl, 1906. Hugo A. Possner (1859-1937), Waterbury, CT. Scottish Rite Masonic Museum & Library Gift of Clark Commandery No. 7, Knights Templar, Waterbury, CT, 92.034a-b. Photograph by David Bohl. 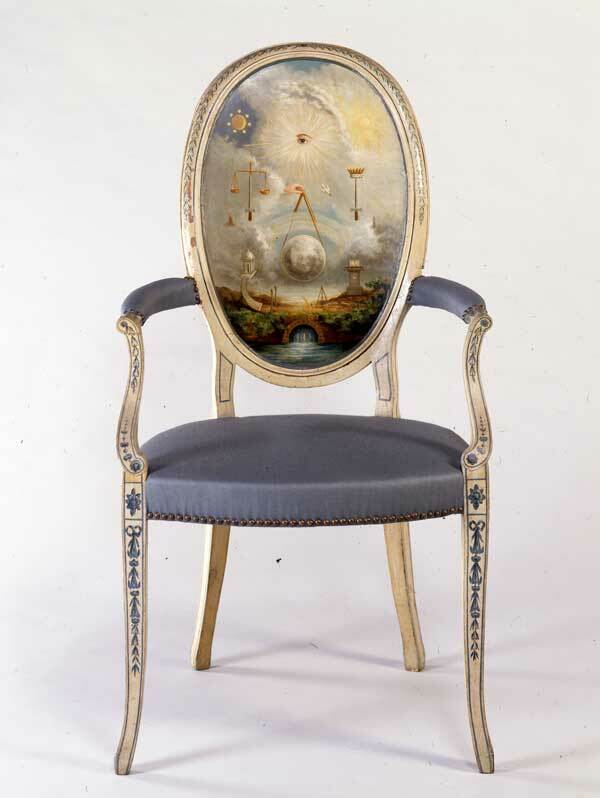 “’Every Variety of Painting for Lodges’: Decorated Furniture, Paintings and Ritual Objects from the Collection” draws on one of the strengths of the collection, Masonic decorative arts created in the 1800s. Featuring over fifty different paintings, watercolor sketches and illustrated archival material — as well as painted Masonic aprons and decorated furniture — this exhibition explores the ways Masons have expressed their involvement with the fraternity. The first section of the exhibition looks at some of the kinds of paintings and decorated furniture craftsman produced for Masonic lodges in the 1800s and will feature ritual objects, painted furniture and tracing boards, including a tracing board made for Trinity Lodge in Clinton, Massachusetts in 1863. Brothers there used this tracing board to instruct new members about different Masonic symbols’ meaning and uses. Lodge records show that in 1863 members had decided to procure a new tracing board and appointed a committee to undertake the task. Committee member Levi Green commissioned this tracing board and presented it to the lodge. 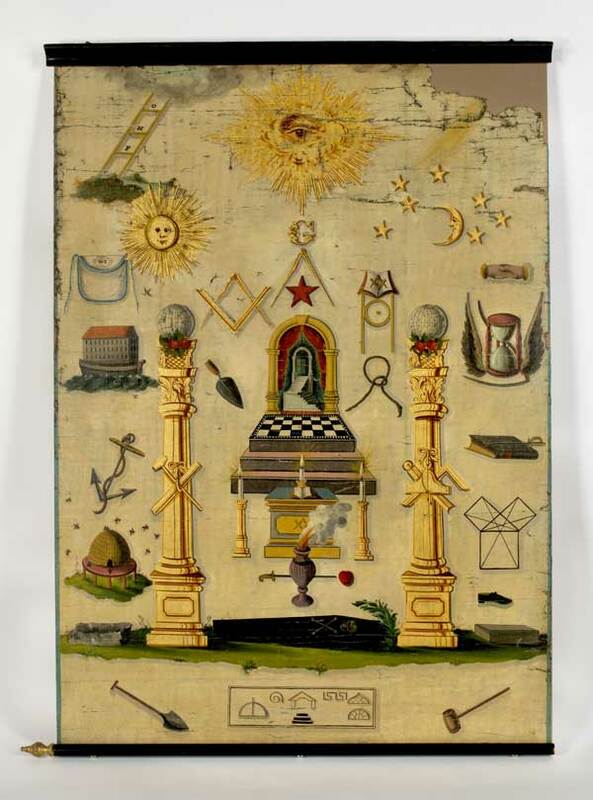 Like many of the artists who created tracing boards and aprons for Masonic clients, the artist who painted the board for Green may have employed a printed Masonic chart as a model for his work. The exhibition also examines the many ornamental painters — both amateur and professional — who drew on their talents to create colorful aprons, illustrations and designs for Masonic clients. 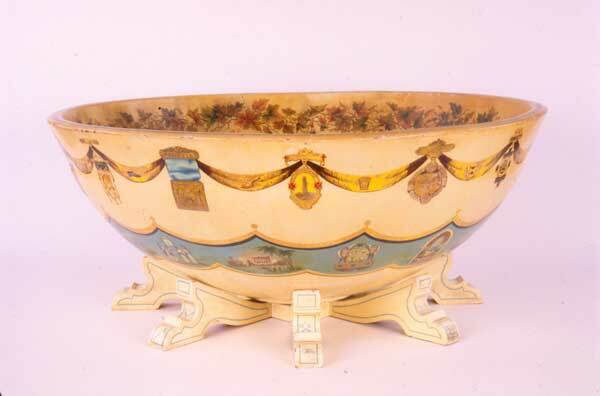 Among the striking example that will be on view is a decorated bowl by Hugo Possner (1859-1937) of Waterbury, Connecticut. As a boy, artist Hugo Possner moved from Germany to Connecticut with his family. A versatile artist, over his career he decorated cars, designed murals and painted portraits and still lifes. 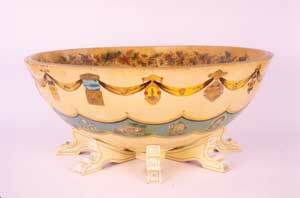 The bowl was presented to Frank Conley (1840-1910) of Torrington, Connecticut. Along the rim of the bowl, Possner depicted badges, banners and insignia associated with different Masonic organizations and meetings — doubtless all related to Conely’s Masonic career. Below, Possner painted different symbols, scenes and coats of arms, most modeled on illustrations in Masonic handbooks. Over the years, Masons have sought to express the pride they felt from their association with Freemasonry, many by commissioning portraits that identified their membership in the fraternity. In 1804 Benjamin Greenleaf (1769-1821) painted Aaron Bird (1756-1822). A charter member of Cumberland Lodge No. 12 in New Gloucester, Maine, Bird became a Mason before 1803, when members of the new lodge first met. For his portrait Bird chose to wear, as his only ornament, a gold pin bearing easily recognized symbols of Freemasonry, a square and compasses, underscoring the importance Freemasonry held for Bird. Bird’s portrait, and the many other objects on view in “Every Variety of Painting for Lodges” will give visitors a glimpse into the decorated world of the 1800s and the many ways ordinary people — as artists and as patrons — used art to articulate their connection to Freemasonry.